Episode 046 – January 18, 2019 – Special ASCA Winter Seminars 2019 Episode and Interviews with Ann Geier, Cristina Bentin and Jenna Alvarez. Episode 045 – January 15, 2019 – Celebrating First Anniversary, NJ ASC Infection Follow-up, signage, pharmacy and IUSS. Episode 044 – December 27, 2018 – ASC Notifies Patient of Possible BBP Exposure, Recent Pharmacy and Radiology Experiences, Annual Update of Your QAPI Program. Episode 041 – November 5, 2018 – Final 2019 CMS Payment Rules and Changes to Medicare Quality Reporting (ASCQR). Episode 040 – Special NYSAASC (New York) Episode – October 22, 2018 – Highlights of the Fall 2018 New York State Association of ASCs conference in NYC and interviews with Association Leadership. Episode 039 – October 15, 2018 – New York State Association of ASCs Meeting Debrief and Focus Segment on Emergency Preparedness and Drills. Episode 038 – October 1, 2018 – OAASC Debrief, Surprise CMS proposed regulatory reduction regulations and their impact on ASCs, Focus Segment on avoiding Adverse Events, and an Interview with Ridley Barron. Episode 036 – September 17, 2018 – CASA Debrief, Patient Safety, Incident Reporting, Near Misses, Deemed Status Surveys and Interview with William Isenberg from Sutter Health. Episode 034 – September 3, 2018 – Human Resources, Fair Labor Standards Act, Breaks and Lunch and a Discussion of MRSA. Episode 033 – August 22, 2018 – Followup on 2019 CMS Regulations, Focus Segment on Discharge and a Discussion of Bedbugs. Episode 032 – August 6, 2018 – Latest News and Continuation of discussion of the CMS 2019 ASC and HOPD proposed payment rates and updates to the Medicare Quality Reporting program. Episode 031 – July 30, 2018 – Special Episode to discuss the CMS 2019 ASC and HOPD proposed payment rates, and updates to the Medicare Quality Reporting program. Episode 029 – July 9, 2018 – Waiting for the 2019 CMS Rates, Discussion of Registration, Advance Directives, Interview with Public Relations Consultant. Episode 028 – July 2, 2018 – Special One Hour Episode eligible for 1 AEU for CASC Certified Administrators. Latest News, Orientation, Mandatory Annual Education, In-Services and Competencies. Episode 027 – June 25, 2018 – A Culture of Safety, Infection Reduction in ASCs and Designing Fire/Disaster Drills. Episode 026 – June 18, 2018 – Operational issues, Digitizing ASC records, Cybersecurity, EMR, HIPAA Security, and other IT issues. Sponsored by Priority One Group. Episode 023 – June 4, 2018 – Pharmacy and Anesthesiology – Perspectives on Drug Usage, Opioids and Appropriate Candidates for Surgery (Available 6/4/18) – Note that this episode has been approved for One “Delivery of Patient Care” AEU Credit for CASC Certified Individuals. 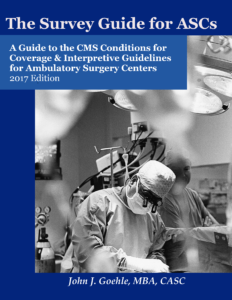 Episode P001 – Ambulatory Surgery Center Governance – A Guide to the Responsibilities of the Governing Body in an ASC. Episode P002 – A Walk Through the Conditions for Coverage – Part 1 – A Discussion of Each of the Conditions for Coverage and What it Means for ASC Regulatory Compliance. Basic Requirements through Environment of Care. Episode P003 – A Walk Through the Conditions for Coverage – Part 2 – A Discussion of Each of the Conditions for Coverage and What it Means for ASC Regulatory Compliance – Medical Staff through Patient Admission, Assessment and Discharge. Episode P004 – A Walk Through the Conditions for Coverage – Part 3 – A Discussion of Each of the Conditions for Coverage and What it Means for ASC Regulatory Compliance – Emergency Preparedness and Conclusion about how to maintain compliance. – Part 1 – Introduction and Balance Sheet. – Part 2 – Income Statement and Statement of Cash Flow. – Part 3 -Financial Management, Budgeting and ASC Financial Challenges. A podcast with host John Goehle – one of the ASC industry’s leading experts in regulation, administration and finance. Join John as he discusses issues of interest to everyone interested in the ambulatory surgery industry. Each episode will discuss current industry news, a current regulatory or operational issues and questions from listeners. Mr. Goehle is one of the leaders of the ASC industry. 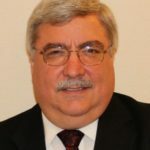 As an author of over 10 books about the industry, frequent speaker on finance, regulation and administration and a consultant – Mr. Goehle brings a broad perspective to the podcast. We are looking for sponsors and advertisers. Please contact John at john@goehle.net.